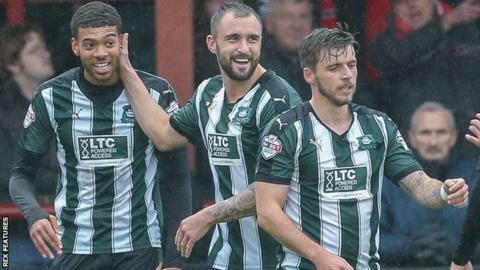 Plymouth Argyle manager Derek Adams says he will begin talks on extending the contracts of Graham Carey, Jake Jervis and Reuben Reid soon. The trio are amongst a number of the League Two leaders' top performers who are out of contract next summer. Jervis and Carey have scored 18 goals between them, while Reid has been top-scorer for the last two seasons. "We'll sit down with the players and hopefully extend some contracts," Adams told BBC South West. All three players could leave the club for nothing in the summer if they do not agree new contracts, with the bulk of the Argyle squad's deals running out at the end of the season. "I need to sit down with the board and we'll do that in the very near future," said Adams. "I've got a strategy that I'll put to them that we want to follow and see where we go from there. "We want to keep our best players in the squad."